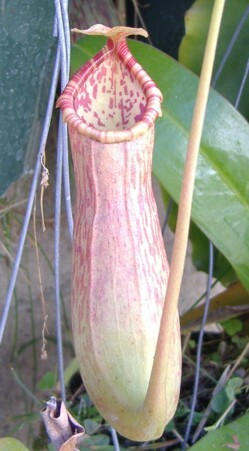 Nepenthes Mixta X ventricosa is an Exotica Plants hybrid between a lowlander hybrid and a highlander. I grow N. X Mixta as a highlander instead of a lowlander and it does well for me unless the temperatures get below 40 F. This hybrid I grow outdoors in a somewhat shaded location. It took a while to adjust to being outdoors but seems to have settled in. To be honest, this plant was on Ebay so I bought it. It wasn't high on my list of Exotica Plants hybrids that I was seeking. The first pitchers look nice but are still on the small size. Another year of growth and they should get larger. Exotica Plants seems to have crossed everything to a ventricosa and you could have an entire greenhouse filled with nothing but N. ventricosa hybrids if you wanted!